A Burned Area Emergency Response (BAER) team is assembled to handle the long-term mitigation of the effects a wildfire has on a region and attempt to stabilize the burned area to reduce its lingering effects on the environment. These teams consist of hydrologists, soil scientists, ecologists, engineers, foresters, archeologists, and other specialists based on the location of the rehabilitation area. Their task is to determine the changes that have occurred in the burned area (canopy cover, soil properties, etc. ), estimate the risk of loss or damages these changes may cause (to the environment and to local populations and structures), determine and recommend the management treatments that take into account the amount of risk reduction and the cost, and then implement the selected treatment. This process is time sensitive; teams need to accomplish these tasks within weeks of the fire containment. While some BAER agents may have a basic understanding of GIS software, preparing the required data while working on time-sensitive projects may be difficult. In some cases, these teams have to wait for GIS specialists to become available to obtain the GIS data for their study area. GeoWEPP-BAER was designed to be a specialized version of the GeoWEPP interface to allow BAER agents to prepare BARC maps as inputs into GeoWEPP through a series of simple stages; the actual GIS preprocessing is done for the agent automatically and only requires a few pieces of information from the user. 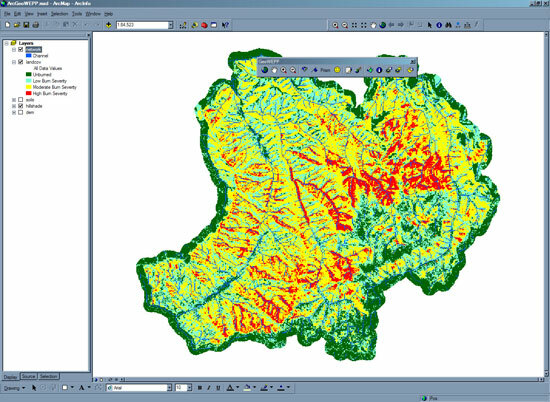 There are three stages to GeoWEPP-BAER: Vegetation and Soil parameterization, GIS Preprocessing, and WEPP Simulation. The first stage provides a simple interface that allows the user to make changes to the WEPP vegetation and soil files they need for their specific study area. 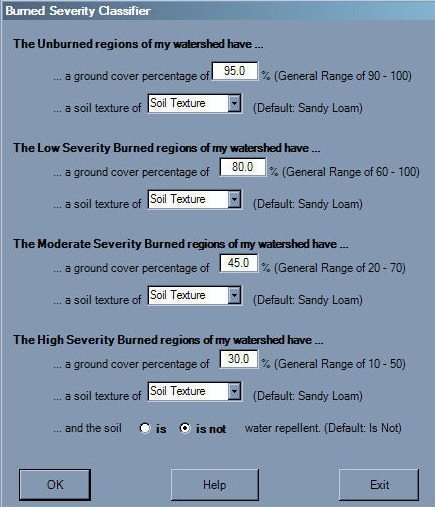 The US Forest Service, through field study and experiments, has standardized the soil and vegetation WEPP parameters to meet their needs; the agent only needs to determine for each burn severity what the soil type is (sandy loam, clay loam, silty loam, or loam), if it is water repellent (hydrophobic) in the high burn severity regions, and provide the remaining canopy cover percentage. 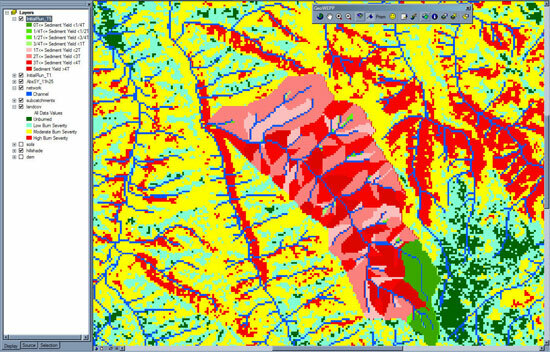 By providing these pieces of information, GeoWEPP-BAER can create, if needed, the corresponding vegetation and soil WEPP files that will be needed for the simulation. 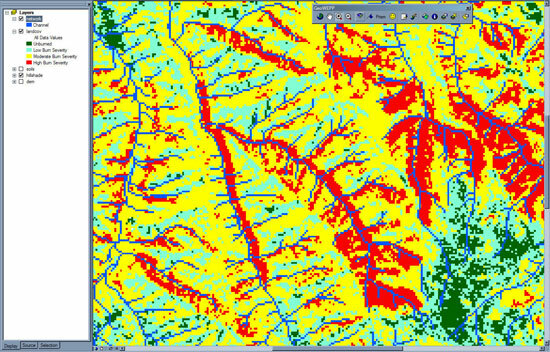 The next step is to preprocess the data for use in GeoWEPP. The process is simplified for the user; all they need is to provide the topography (one or more DEMs) and the BARC map and know the UTM zone of their study area. GeoWEPP-BAER does all the preprocessing for the user: merging the DEMs, changing the projection of the DEM and/or BARC to the appropriate UTM zone, and converting the DEM and BARC map to the required GeoWEPP input parameter file format. 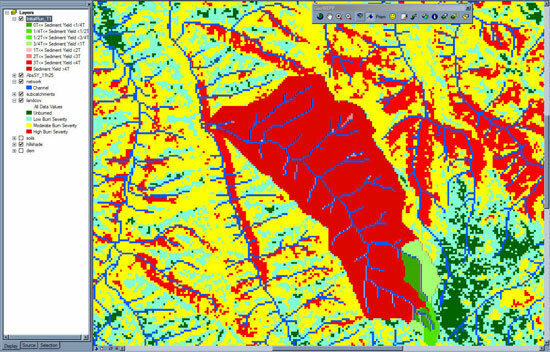 Once the GIS data has been preprocessed and prepared, the user can modify the burn severity ranges within the BARC map. 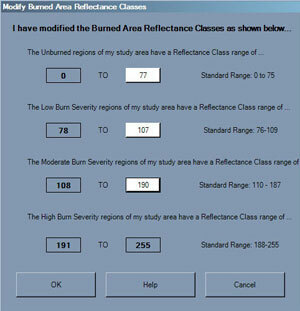 The BARC map classes range from 0 to 255; each burn severity has a default range within these values, but these may need to be modified based on ground observations. GeoWEPP-BAER provides a handy interface that makes it easy for the user to make these changes. 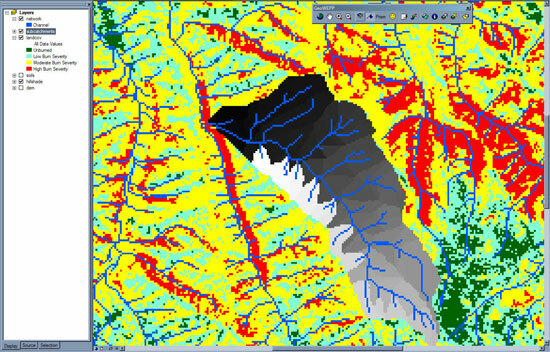 This is the final step before the user can begin the erosion modeling and risk analysis.